Why Aren't Stocks Recognizing the Great Economy and Earnings? I was asked by a financial professional yesterday why the stock market has struggled so mightily over the past few months. Before responding, I asked a question of my own, "First, let's define what you mean by 'the stock market.'" As I assumed, this advisor was focused on the venerable Dow Jones Industrial Average. To be sure, the action on the chart of the Dow hasn't been upbeat for many moons now. As the chart below illustrates, the index has moved sideways since February. So, now that I had established what this financial advisor meant by "the market," we could move on. He made his point quickly. "The economy is doing great and earnings are growing, so why isn't the stock market doing better?" I admitted that his question was fair. However, I also let him know that the question itself suggested a weak understanding of how the stock market game is played. I started by reminding him that the stock market is a discounting mechanism for FUTURE expectations - and not a reflection of what is happening now. As the saying goes, "Something everyone knows, isn't worth knowing" (especially from a trading perspective). As such, my first point was to remind the advisor that the current state of the economy and earnings were likely "discounted" to a large degree last year. I opined that returns appeared to have been "pulled forward" as market participants celebrated the tax package. "While there can be no doubt that the tax deal, which included big incentives for companies to repatriate cash to the U.S., gave the economy a boost, it is important to recognize that the S&P 500 gained 18.6% from June 30, 2018 through January 26, 2018," I said. Put simply, investors "discounted" better economic times with a gain that is more than triple what is "normal" for the stock market over a 7-month period. 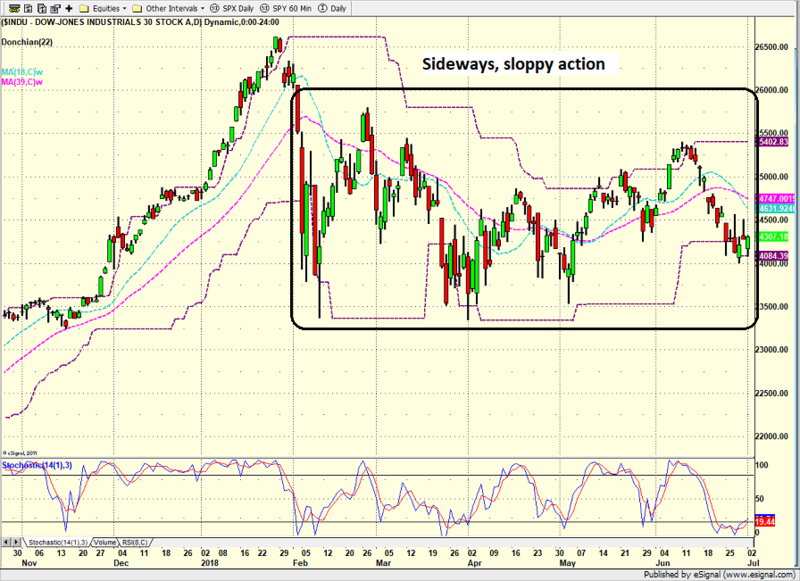 Next, I pointed out that the current "sloppy period" likely represents a consolidation of those big gains. I added that the uncertainty about the future stemming from the trade tiff and the Fed's plans is likely the culprit for the protracted period of sideways action in the market. I went on to suggest that periods of consolidation were healthy from a big-picture perspective. I likened this to a period of digestion after a Thanksgiving meal. One usually pauses to digest before partaking in the leftovers. From my seat, this is exactly what is happening here in the stock market. Investors are waiting for two things. First, investors are waiting to see if the economic expectations that triggered last year's big run become reality. Remember, valuations are high at the present time. And anyone who lived through the 1999-2002 period in stocks is painfully aware of what happens with the market gets overly excited about the future. Second, investors want clarity on what this trade war is going to look like. Predictions of the potential damage to earnings and the economy are cropping up daily and all over the map. This, of course, creates uncertainty. And what do investors due when they are uncertain? Longer-term investors tend to sit on their hands while the fast-money types like "trade the range" by selling the rips and buying the dips. I concluded the call by suggesting that, so far at least, the current sloppy period looks pretty "normal." I opined that if the economy and/or earnings continue to surprise to upside once the uncertainty over trade blows over, stocks could easily advance. And as such, I offered that although my analysis can be viewed as overly simplistic, it was simply too early in the game to give up on the year. However, I also pointed out that with some of my indicators starting to falter, this is no time to be asleep at the wheel. "Remember, trees don't grow to the sky," I said. "And at some point, the current bull cycle will morph into a bear. So, we've got to stay diligent from a risk management perspective." Publishing Note: Due to the holiday and traditionally light trading activity, my next report will be published on Monday morning, July 9. Trust doesn't come with a refill. At the time of publication, Mr. Moenning held long positions in the following securities mentioned: IJR - Note that positions may change at any time.